Zooey Deschanel has lived in our hearts through small roles since the early 2000’s, but it wasn’t until The New Girl premiered on Fox in 2011, that we wanted to be just like her. Her particular charming brand of joie de vivre is not as difficult to imitate as you might have imagined. Here is a guide to integrate that trademark geek chic look into your own sophisticated style. Don’t worry, bangs are not a requirement. The obvious first step is choosing the correct glasses frames. This is an opportunity to be bold ladies – thin, understated frames will not do. Thick frames are the cornerstone of the look, upon which everything else rests upon. Thickness in a geek chic frame is imperative, as well as a rectangular or square shape and darak colour. Try a thick, rectangular, black frame to begin with. Slightly rounded frames are also acceptable, but be sure they aren’t thin or metal based. Don’t forget, there are incredible deals online for all kinds of stylish glasses for women in a variety of colours and most are really affordable if you shop around. The next step is pairing your new strong statement eye glasses with natural looking, yet styled hair. 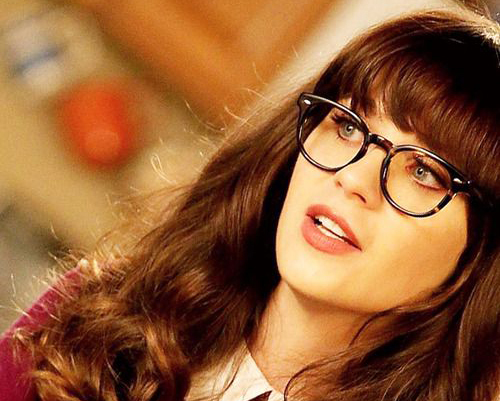 Jessica Day aka Zooey Deschanel is rarely seen with an up-do. Yes, it takes time, but giving your mane a long curly look will put the chic in your glasses geek. Begin by separating your hair into sections, take each section and wrap it around the barrel of your curling iron in an outward direction. Set the hairstyle with a light hairspray, and separate the curls gently with your fingers so that the ringlets fall into a lovely, voluminous coiffure. Headbands, formerly a faux pas when paired with geeky glasses, are no longer! Your hair is down, fabulous and fluffy, but you’re a busy girl. Place a headband two or three inches back from your hairline to set off the look. Choose thicker bands to match the thickness of your frames and compliment your outfit. The final piece of the Zooey puzzle is the outfit. Don’t worry about dressing too young for your age. Jessica Day is known for dressing more mature than she is. Get excited ladies, this is the fun part. Enjoy flowy, knee-length skirts, patterned, tucked in blouses, tights and colorful flats. On special occasions, explore calf-length dresses of a single colour that will compliment your eyes, pair again with flats and tights, for a sophisticated, sharp display. Once you’ve chosen your ensemble, ensure that your funky glasses frames match the base color of your clothing. If you’re sporting a brown belt, it is important to pair it with brown frames. However, as geek chic is a simple, and refined look, it is imperative to stick with black or brown glasses, the colour should remain in the clothing. Now that you’ve got the frames, the hair, and the outfit, you’re ready to rock geek chic. Optional additions to the look include, singing to yourself, spouting interesting and unique knowledge of literature and music, and involving yourself too deeply in the affairs of your friends.